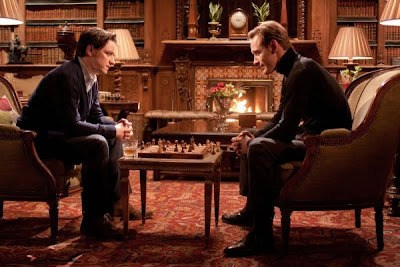 Fassinating Fassbender - A Michael Fassbender Fan Blog: Michael talks Magneto! Unbelievable! 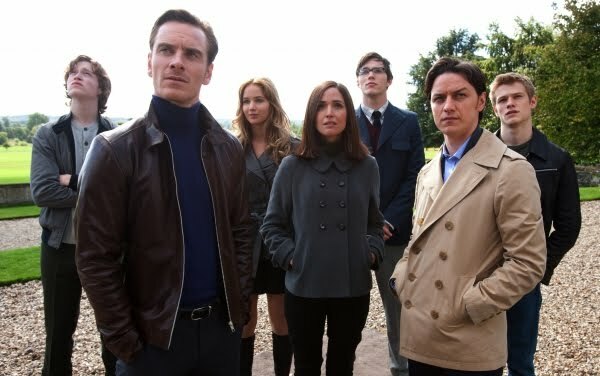 For the second day in a row, I have something to report about Michael Fassbender's career propelling role in X-Men: First Class! He gave an interview to Josh at Comicbookmovie.com and spoke about his Magneto character for the first time! "Hopefully I won't disappoint the fan base out there, because I know that what Ian McKellen did sort of latched onto a lot of imaginations and was very successful. But what drew me was the script and Matthew Vaughn and the fact that James McAvoy was going to be playing young Xavier. I thought it was a fresh take on the whole story. I've never been a big comic book enthusiast, but I thought it was an interesting concept to go back to when they were both friends and initially came together." "Yes, it did, and I got knee-deep into them once I got involved. That was all my source material, because it's all there in the comic books in terms of a backstory and formulating the character. I did also watch the other films and took notes from those, but took most of my references from the comic books." "He's such a complex character, really, and the idea of him being a villain is interesting considering his history (Lehnsherr is a Holocaust survivor who lost his family in the camps, and later lost his wife and daughter) ... he's a very solitary individual, and the pain and grief that's gone on even before we meet him in this film is an interesting pool of information to draw from, in coming up with this Machiavellian character for whom the ends justified the means. You can see where he's coming from. Human beings don't have the greatest track record in what they've done throughout history, so his point of view is, "Well, we are the next stage of evolution -- (humans) are to us what Neanderthals were to Homo sapiens." "I think the fundamentals are the same. The main thread of the story is still the same. I don't really know how to answer the question because I haven't seen this one yet, so I haven't had a chance to watch it side by side with the other ones and see if they're relative to each other. Hopefully they are, I think, but also we want to do something fresh as well and open a whole new chapter with this without totally betraying what was laid down before." "The cool thing about this movie is that I think it does deal with each individual mutant, and the ones they've chosen are all very much individuals and unique personalities with unique gifts. What's interesting is that we've gone back to a period where the mutants don't know that there are other people out there like them. They just think they're freaks and outcasts from society ... all of these new characters are fearful of their gifts and uncomfortable and misplaced in society, so hopefully when they all sort of come together and realize they're not alone and feel more comfortable in their own skin, that's a discovery for all the characters that you experience." "There's a scene where they just sort of transformed this hall in London into Buenos Aires Airport, and I just looked around this mock airport and said to myself, "My God, I've just had a feeling of being in the '60s." From the colors to the costume designs to the production design itself, there's a sort of nostalgia in the air when you look around the room. It's just from my own perception of the '60s, and all that came with it in terms of the music and the fashions and so forth, but all of that comes across in the visual references that we all have. All of that is there to encapsulate the feeling of that era, for sure." "As for our costumes, we went back and forth on so many things. We added things that worked in the comics, took them away again, and stripped them down again. ... When it came to the Magneto suit, you know, there's various stages of what has been done with it, but you will have something that is traditional to the comics. There is a helmet (laughs), which is of course essential to keep Charlie-boy out of my head, and the colors are also kept traditional to the comics, that sort of red and purple. I don't know if I'm giving you too much, but I'll say it anyway (laughs)." "I certainly hope so. My face is gonna be up there and my name is gonna be attached to it. I've got a lot of faith in Matthew, and everyone is very passionate and working very hard to earn back any trust that's waned a little bit from the last film." As usual, Michael took an indepth and respectful view of his Magneto character and presented to us very intelligent and thought provoking responses. While many of us are fans of Ian McKellan's Magneto, now more than ever, based on Michael's feedback thus far, he has confirmed that he will be an awesome Magneto in this prequel film. I can't wait to see it on June 3rd! The move back to the blue and yellow costumes basically makes Jackman's comment in the first movie sound ridiculous.